Here are two storytellers that seemingly trust and embrace the cinéliterate audience to extrapolate, to understand, of their own volition. 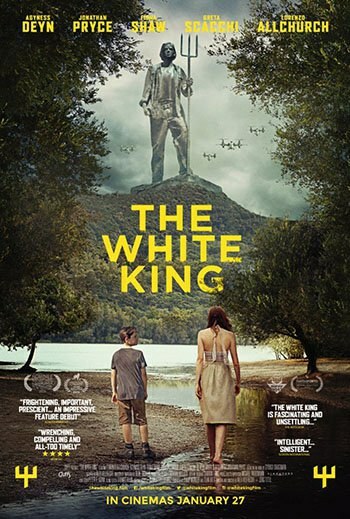 Jörg Tittel and Alex Helfrecht’s directorial feature debut, The White King, an adaptation of György Dragomán’s dystopian novel of the same name, is the story of 12-year-old Djata (Lorenzo Allchurch). The arrest of his father by the totalitarian state is the catalyst for his own coming of age, and the ostracisation of he and his mother, Hannah (Agyness Deyn). “I like the dreams of the future better than the history of the past.” These words of Thomas Jefferson resonate with Tittel and Helfrecht’s dystopian vision. Told through the eyes of its young protagonist, The White King sows the seed that one hopes will grow into a dream for a future that is preferable to “the history of the past”. Yet if Djata, like an earlier youthful heroine in Katniss Everdeen (Jennifer Lawrence) of The Hunger Games trilogy, are the heroes upon which “the dreams of the future” rest, then the wisdom of the Buddha -- “Do not dwell in the past, do not dream of the future, concentrate the mind on the present moment” -- is ingrained in a story told with pragmatic patience. Unlike other dystopian tales, amongst them Orson Welles’ The Trial (1962), Jean-Luc Godard’s Alphaville (1965), Ridley Scott’s Blade Runner (1982) and Alfonso Caurón’s Children of Men (2006), Tittel and Helfrecht show little interest in a self-contained story. The choice is one that risks provoking a backlash, but the emphasis on a moment, the chapter between the rise and fall of a regime, strikes up the most unusual or rather unexpected of acquaintances with Kelly Reichardt’s Certain Women (2016). An adaptation of author Maile Meloy's collection of stories, Reichardt’s film is a celebration of the small moments in the lives of the characters. Although one film is set in Montana, the other in a fictitious dystopian country in the future, Reichardt, Tittel and Helfrecht show storytelling as a communal language, or one of close association in spite of seemingly deep contrasts. The White King is a bold and brave piece of filmmaking that embraces film as an incomplete form. The ideas are presented in such a way that they require the engagement of the audience. While it's true that any film is fundamentally an incomplete object until it's experienced by a single spectator, here are two storytellers that seemingly trust and embrace the ciné-literate audience to extrapolate, to understand, of their own volition. During my interview with writer-director Nicolas Pesce for the FrightFest blog, I asked him about the striking omission of a key scene from The Eyes of My Mother (2016). He explained: “Part of the speed and tone of the movie was giving the audience places to answer for themselves… By letting the audience do the work, whether it's the dramatic work or the scares, it will be more relatable to them if they are the ones answering the questions.” Tittel and Helfrecht’s brand of creating space for the audience is perhaps less overt, presenting a tapestry of ideas or images that requires us to build outward from, to intellectualise those seeds sown in the emotional experience of the film. As an Orwellian inspired adaptation, the voyeuristic state whose presence is noted through shots of cameras is also sparingly incorporated. These are interwoven with the coming of age narrative, the violent tussles with bullies to discovering the reality in the stories that lend the world a mysterious, strange and fantastical aura. Told through the eyes of an adolescent, the film looks to the replacement of the old by the young, and the attempts of the established order to safeguard tradition. The filmmakers understand there's a process of shedding the childlike perspective for the adult world view. While our adult perspective sees revolution and the collapse of the state, Djata’s are more humanly simple: he wants to be reunited with his father. This speaks to the difficulty of following the wisdom of The Buddha, because as humans the struggle to not dwell on the past or to look to the future is a constant challenge. This is attributable to the simple fact that making peace with or resolving the past forms the future dream or hope we are striving for. While Djata’s simple hope captures a snapshot of the past, present and future coinciding within the folds of the drama, adulthood is exposed as a contradiction. This revelation looks to the work of C.G Jung, specifically the inherent pull between the desire to be an individual with the desire to assimilate ourselves into our immediate society. Djata’s grandfather (Jonathan Pryce) is a representation of internal and external conflict. The character is initially simple; he's revealed to be an individual suffering complex feelings, and damaged by the contradiction of his outward projection versus his inward feelings. Pryce’s character throws up the question of how impermanent our identity is. In the same way as the state creates a version of history, through this single character we see the contradiction of identities that are created for purposes of social belonging versus who we are in our isolation, or with those we place trust to reveal our inner most feelings. If The a White King is told through the perspective of an adolescent, Djata’s interactions with his elders echoes Jung’s observation that we learn about our world in our formative years, while our post-adolescence is spent understanding ourselves. Yet this understanding is one convoluted by acts of contradictory self-authorship. Interviewing Tittel and Helfrecht for the Aesthetica Short Film Festival blog for the UK theatrical release of the film, they described the purpose of any dystopian novel or piece of fiction as being: “To hold a mirror to where we are today.” From within the oppressive folds of a future dystopia emerges a stark presential warning. While numerous documentaries, amongst them The Square (2008) and Silvered Water, Syria Self Portrait (2014) have been produced looking to the struggle against totalitarian regimes in the Middle East, Tittel and Helfrecht's dystopian and fictional future is not far removed from our present. The White King is a bold vision crafted with conviction, whose youthful hero is destined to escape his own transformative brawl, and forges a powerful and evocative tale of adolescence mortally wounded.